I made the following for my Oktoberfest event. You can read and get other recipes from the event HERE. Combine cheeses in a bowl with flour. Add beer to a small pot and bring up to a bubble over medium heat. Reduce the heat to simmer and add cheese in handfuls. Stir constantly, melting the cheese in batches. Stir in a figure-eight pattern with wooden spoon. When the cheese has been incorporated fully, stir in the mustard, hot sauce and Worcestershire sauce. Transfer fondue to warm fondue pot. In a large skillet, bring 2-inches of water to a boil and blanch the cauliflower for 2 to 3 minutes, drain and arrange around the fondue pot. 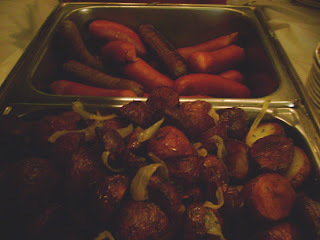 In the same pan, bring the cooking water back to a boil and add the mini franks and sliced wursts. Cook, uncovered until all the liquid has evaporated. Add 1 tablespoon butter to the pan to crisp the casings. 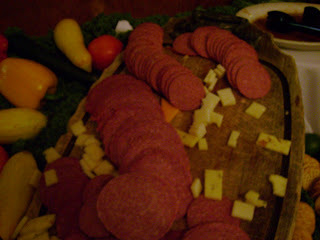 Pile wursts and dogs near fondue. Complete the dipping selections with dishes of pickles, onions and cubed bread. Thoroughly wash potatoes and boil with the skins on until tender (about 25 minutes). Remove potatoes from pan and drain the water. Return the potatoes to the pot and place over a low heat shaking constantly to dry the potatoes. Peel and chop potatoes into 1/4-inch pieces. Place potato pieces in a large bowl and toss with onions, parsley, salt and pepper. Set aside. Meanwhile combine the vinegar, water and sugar in a small sauce pan and bring to a boil. Whisk egg in a bowl and pour the vinegar mixture over top while stirring. Add salad oil and stir. 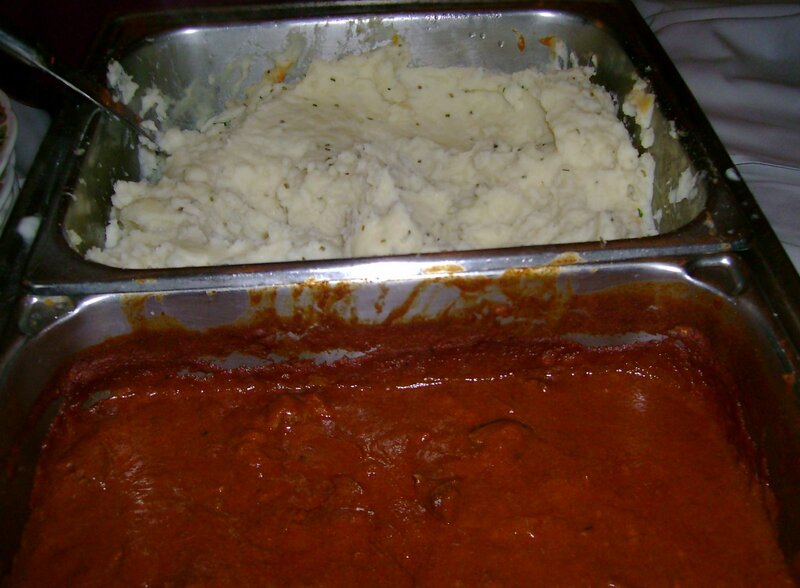 Pour this mixture over potatoes and place in a large skillet or pot over a low heat. Cook until evenly heated. Top with crumbled bacon. Flatten each pork chop lightly with a flat meat mallet or heavy skillet into a uniform thinness. Place the flour on a plate or in a glass baking dish and season with salt and pepper. Place the eggs in a baking dish or pie plate. Place the seasoned bread crumbs in another baking dish or glass pie plate and stir in the sage. Dip a pork chop into the flour, coating both sides and shaking off excess. Next, dip into the egg, coating well, then into the seasoned bread crumbs. Place on a plate and continue until all 6 chops are breaded. Heat 1 tablespoon of the vegetable oil in a large nonstick skillet over medium-high heat. When the oil is hot, add 3 of the pork chops and cook until golden brown, about 2 minutes. 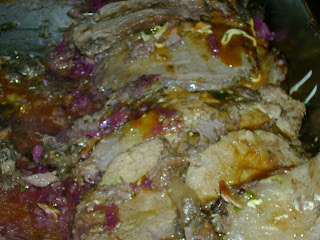 Turn and brown on other side, cooking until done, about 2 minutes more. Remove to a paper towel-lined plate, add another tablespoon of oil to the skillet and brown remaining chops, adding them to the plate and setting aside when they are done. Add the mushrooms and garlic to the hot skillet. Season with salt and pepper and saute over medium-high heat until the mushrooms are golden, about 5 minutes. Stir in the chicken gravy and lemon juice and bring to a boil. Place the pork chops on a platter and top with the sauce. Get my boots… it’s snowing! Today I met up with my cooking group members to get a taste of Germany! 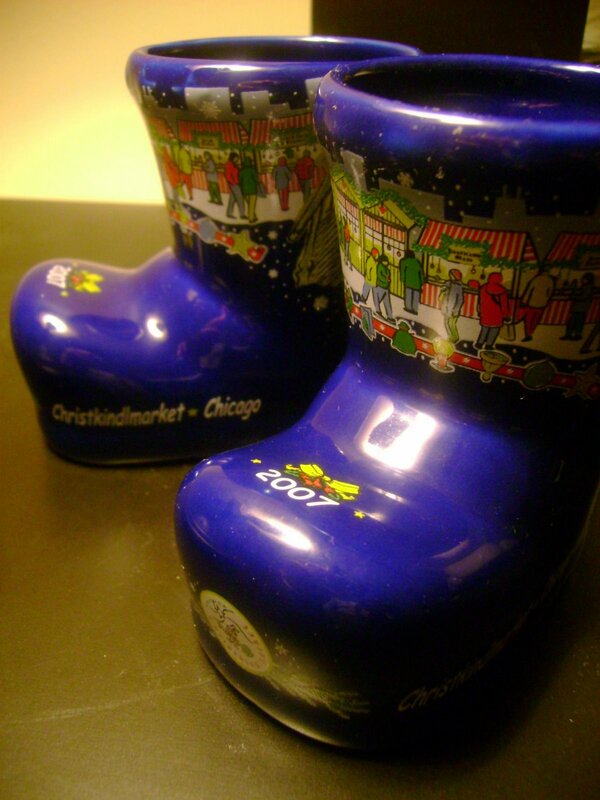 Chicago hosts an annual German event called the Christkindl Market. Visitors from all over the world come to the Christkindlmarket Chicago annually and the numbers continue to grow every year. 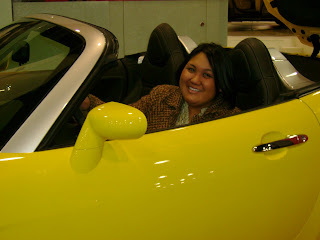 It is so popular and loved by all that any Chicagoan will tell you that they could not imagine the city without it. It is no longer just a German tradition – it has become a Chicago institution.The unique shopping experience, the typical German food and drinks, the diverse holiday entertainment, and a place to enjoy the city during the winter season, makes this a preferred and popular destination. I forgot to bring my camera today but I did bring back a cute souvenir. These little boots held my hot apple cider & Gluhwein (traditional hot spiced wine) which we all drank to keep warm from the cold and snow! Some foods that our group tried included apple pancakes & potato pancakes. 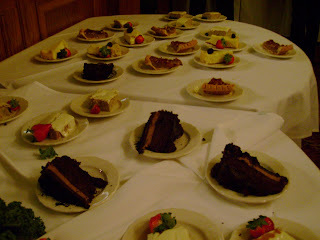 Everything looked delicious however the cold must have gotten to me (and everyone else!) It was a chilly 20+ degrees with the windchill and once it started snowing, quite a few people cleared out. 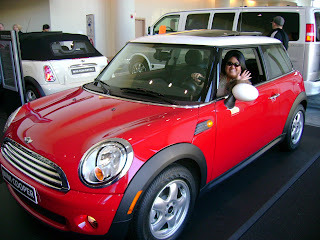 Hopefully next year when I make my next visit, it won’t be so cold! My Big Fat German Apple Pancakes! 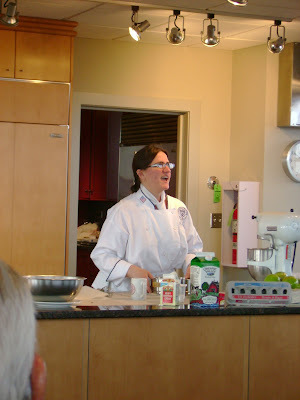 Today I attended a culinary presentation and demonstration at Kendall College. Today’s presentation was on the Big Apple Pancake: Chicago’s Ultimate Comfort Food, presented by Steven L. Katz. Steven L. Katz is an author and food writer whose recipes and articles have appeared in Gourmet, Bon Appetit, The Chicago Tribune, The Washington Post and more. 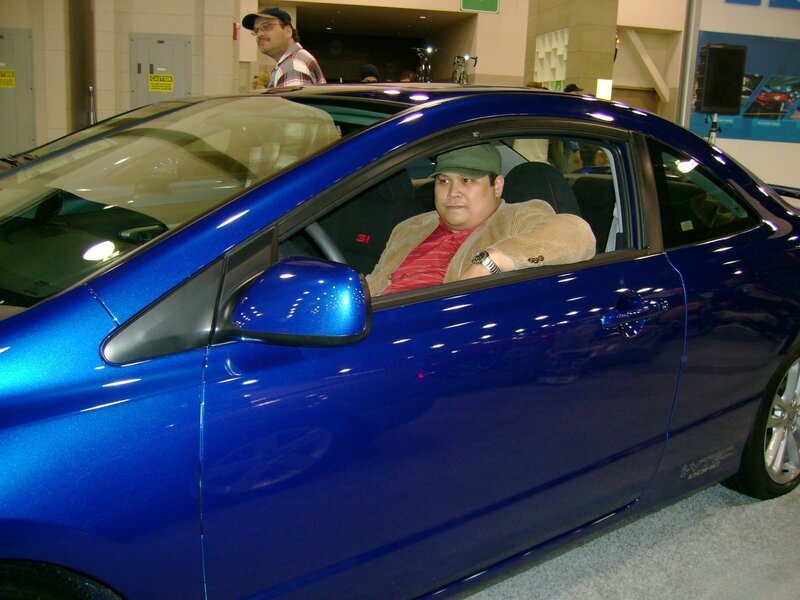 Steve Katz grew up on Chicagos North Shore eating at Walker Bros. The Original Pancake House on Green Bay Road and has visited the original Original Pancake House in Portland, Oregon — where he met founder Les Highet. Steve’s parents grew up on Chicago’s North Shore Side and they loved the apple pancake at Chicago’s Red Star Inn Restaurant. 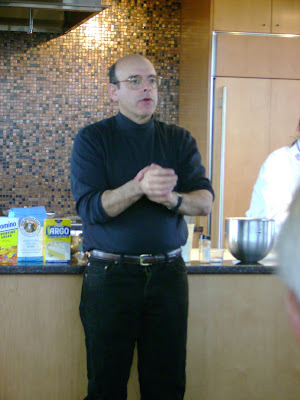 Steven L. Katz, author of “Chicago’s Big Apple” (The Chicago Tribune, January 10, 2007) reveals the whole sugar cinnamon glazed story of the baked German apple pancake in Chicago. The presentation featured a Classic Baked German Apple Pancake Demonstration, tasting, and “Q and A” with Kendall College’s Heidi Hedeker, Chef of Pastry and Baking. Additionally, secret Chicago recipes for the Classic Baked German Apple Pancake was shared. 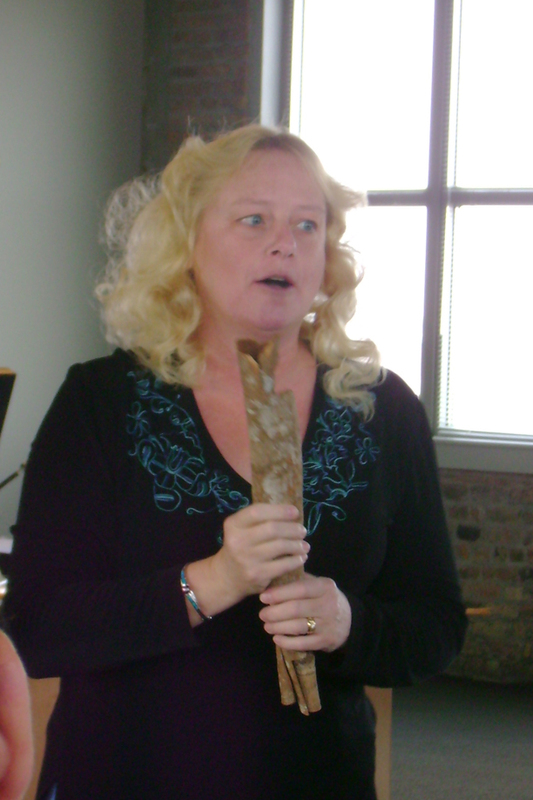 In addition to Steven & Heidi’s informative presentation, Patricia Penzey Erd, of The Spice House, shared a bit of history on cinnamon and the various kinds there are. 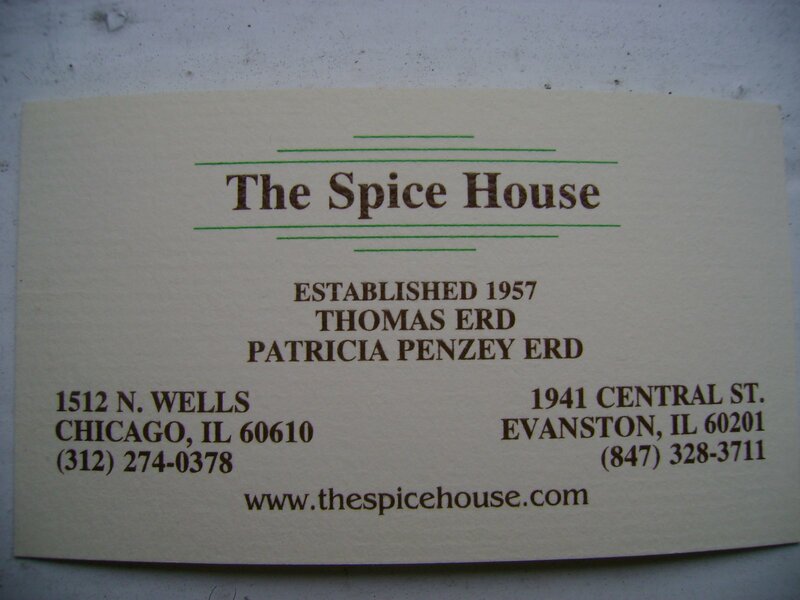 Patricia is the sister of Bill Penzey, owner of Penzeys Spices. 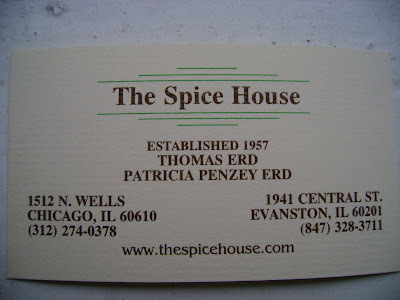 Both are extremely knowledgeable on spices, so do check out Patricia’s website for The Spice House for all their quality spices! Not only was the cooking/baking science explained behind the particular ingredients that are used to make a Classic Baked German Apple Pancake, the history of how pancake houses have evolved and the specific ties to Chicago were explained. The rich culinary history and science behind such a simple, comforting food truly gives one a greater appreciation of food in general. Here is Saigon Cinnamon (also known as Vietnamese Cinnamon). 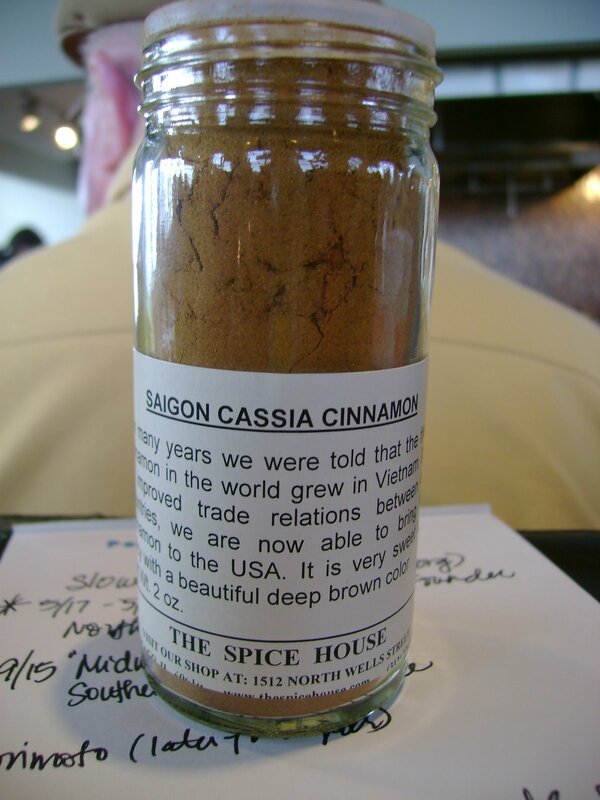 Saigon Cinnamon is used primarily for its aromatic bark. 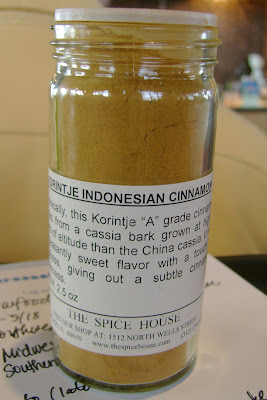 Here is Korintje Cinnamon. This cinnamon is a favorite in the baking industry. 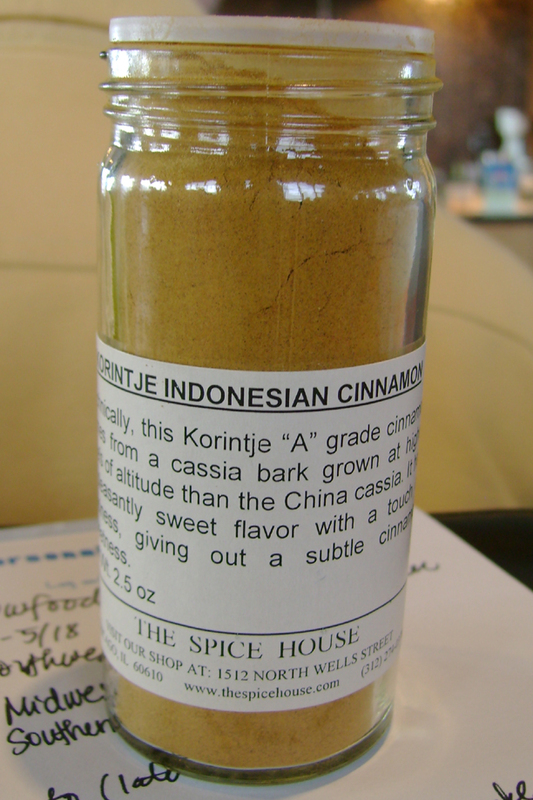 It has a 3.5% oil content making it more flavorful and robust than ordinary cinnamon. Here is Ceylon “True” Cinnamon. 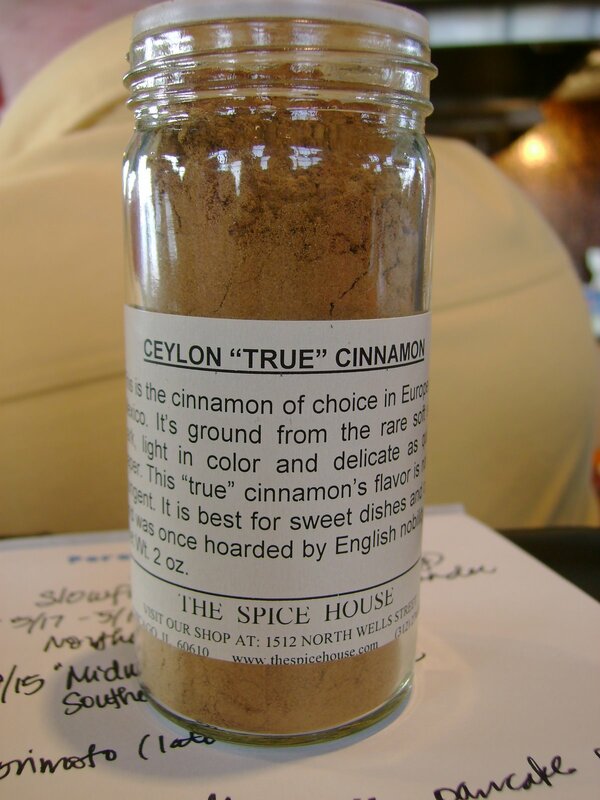 Complex and fragrant, with a citrus overtone and rich buff color, Ceylon cinnmamon is unfamiliar to most Americans. 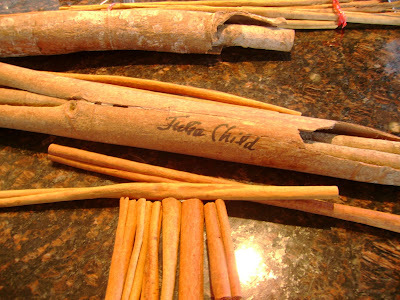 Although less strong than cassia, it is prized in both England and Mexico where it is preferred over cassia for all uses. 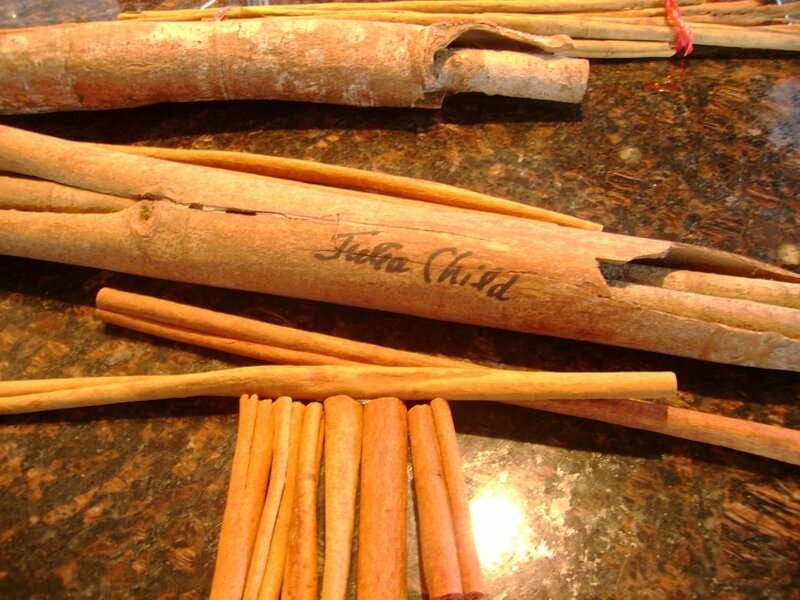 Patricia also shared with us her prized cinnamon stick, which was signed by the famous Julia Child herself! The correct pan for the classic Baked German Apple Pancake is an 8″ inch non stick skillet with sloped sides and a three cup capacity. 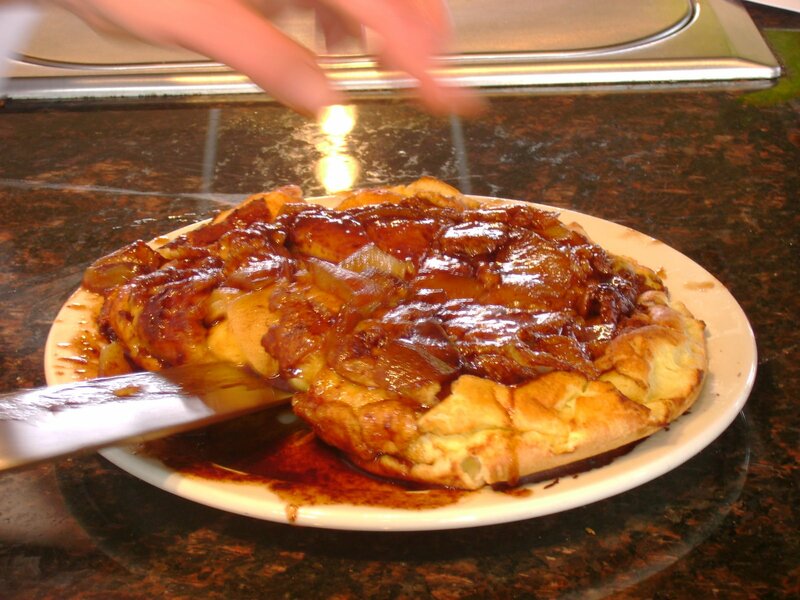 It is the standard pan used by restaurants that prepare th Baked German Apple Pancake. 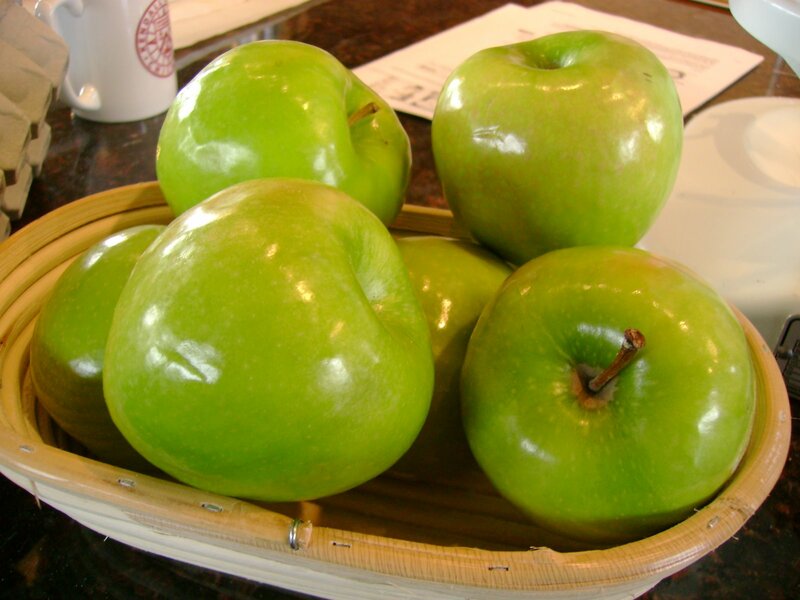 Granny Smith Apples – they provide the right amount of tartness and can hold up to the high heat when its baked. 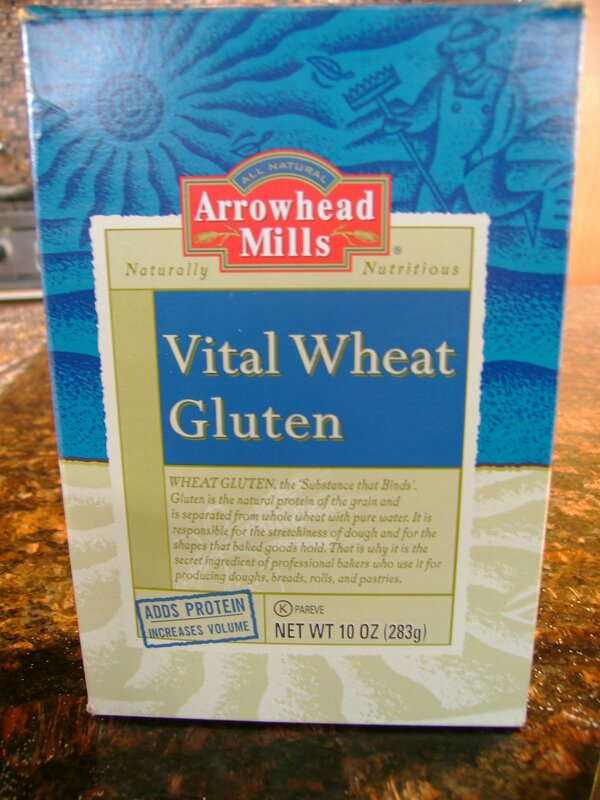 lemon juice and then sauteed for 3-4 minutes in 1 tablespoon of butter. The acidulated water helps the apple slices to maintain its shape and texture before introducing it to the pancake batter. The streusel or cinnamon sugar mixture is one that can heat and melt enough to form a caramel, without hardening. This adds the sticky sweet element needed in a good Baked German Apple Pancake recipe. 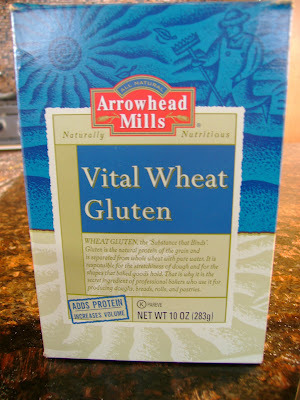 In addition to eggs, skim milk and a touch of heavy cream, the dry ingredients in creating the pancake batter involves the use of Vital Wheat Gluten. This adds additional protein to the scientific makeup, allowing the pancake to “bubble up” around the edges – a special characteristic of big apple pancakes. This recipe is prepared by lightly sauteing apples in butter and then laying them in a dry bed of blended sugar and cinnamon. The batter is then poured over the aples and the pan is placed in the oven. 3) Finally, “fire up” the apple pancake for 15 minutes at 450 degrees to allow it to rise dramatically. When finished, the pancake is inverted onto a serving plate with the caramelized apples on the top. 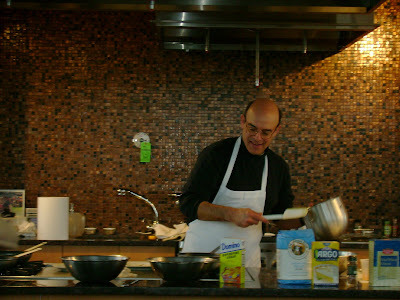 – Using electric mixer with whisk attachment, whisk eggs until foamy, then pour milk & cream into mixer bowl and blend well. – Mix dry ingredients together in separate bowl, then add gradually to egg mixture, a tablespoon at a time, on low to medium power. Continue mixing, scraping sides on bottom with rubber spatula. Then mix on low speed for five minutes. -Let batter sit for at least 10-15 minutes. 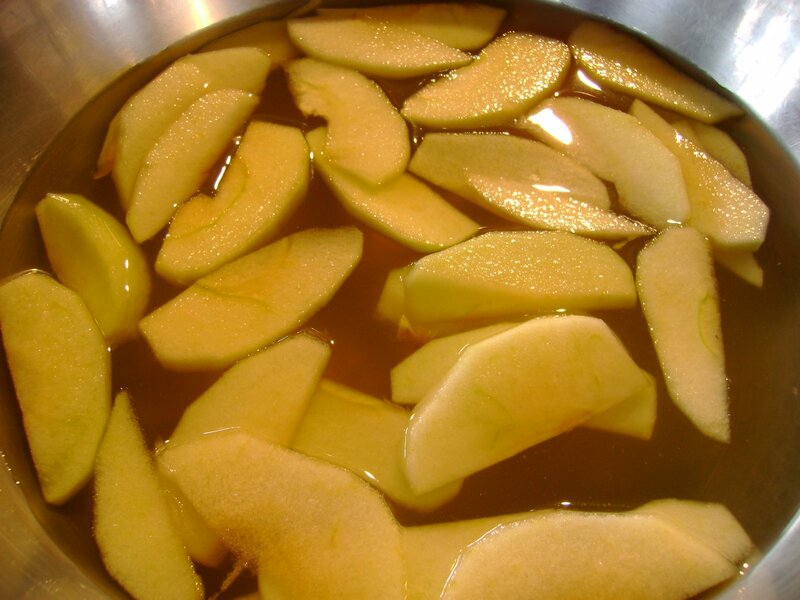 – Prepare the apples by melting 1 tablespoon butter in pan. – Place 30 apple slices in pan and saute for 4 minutes covered at medium heat turning one or twice. The apples should be sweating, not browned or cooked through. Remove apples to a separate bowl. 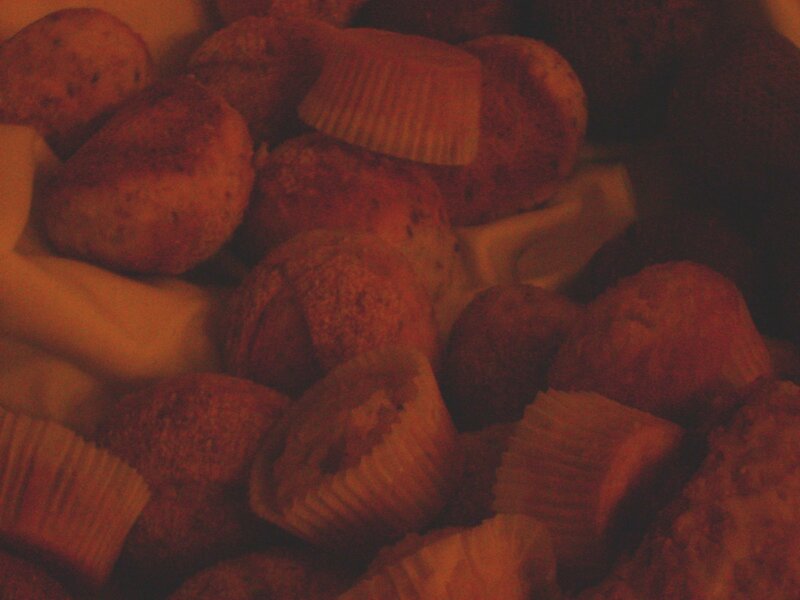 – Prepare cinnamon sugar mixture by combine sugars and cinnamon in a bowl. 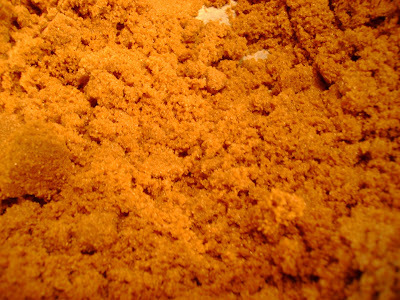 Sift the cornstarch into the mix and blend thoroughly with a fork removing lumps. 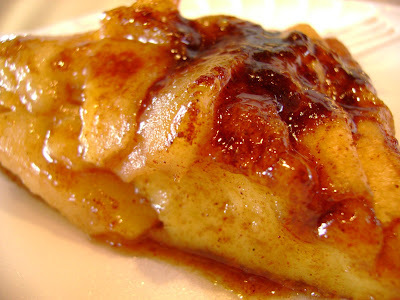 – Melt the butter in the pan & pour it into the cinnamon sugar using a fork to mix thoroughly. It will resemble a streusel-like topping. – Spread cinnamon sugar mixture over the botton of the pan using the bottom of a fork. – Layer apples (do not pile up in middle) over the cinnamon sugar mixture to cover bottom of pan. – Measure exactly 1 3/4 cups of batter and pour batter over the apples that have been placed over the cinnamon sugar mixture in the pan. * If you pan appears to fill up before using all the batter, fill the pan with batter up to at least a 1/4 inch below the rim. It will not overflow because the initial baking cycles are at low heat and the batter will set. – Place pan in preheated oven and reduce heat to 250 degrees. Bake for 30 minutes. 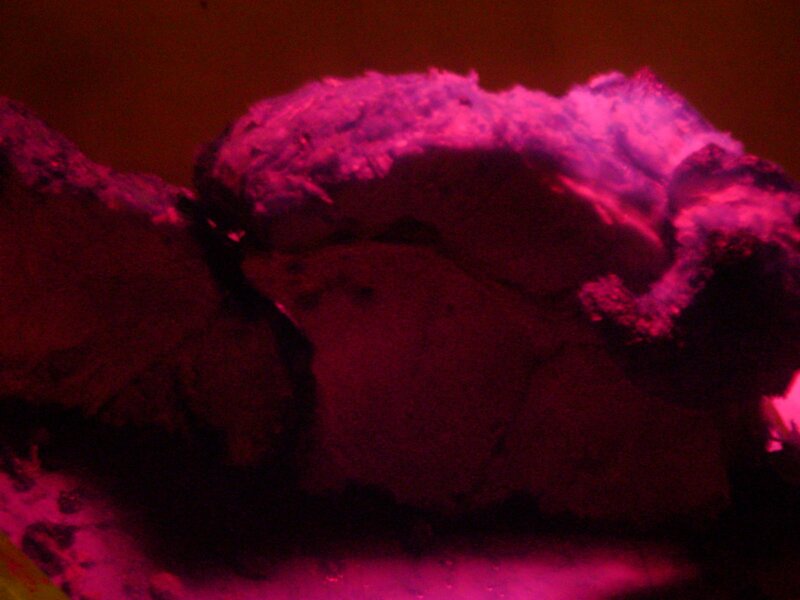 – Remove pan from oven, cover with foil and place on stovetop to rest. – Increase oven temperature to 500 degrees. – When oven reaches 500 degrees, remove foil and place pan in oven; immediately reduce temperature to 450 degrees and bake for 12-15 minutes. – Have a serving platter or large dinner plate ready where you serve the pancake. 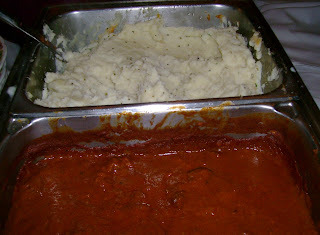 – Remove pan from oven, carefully invert pan onto serving plate by holding plate with one hand. Serve immediately. The end product is a beautiful sweet caramelized treat that is fondly known as a Classic Baked German Apple Pancake! 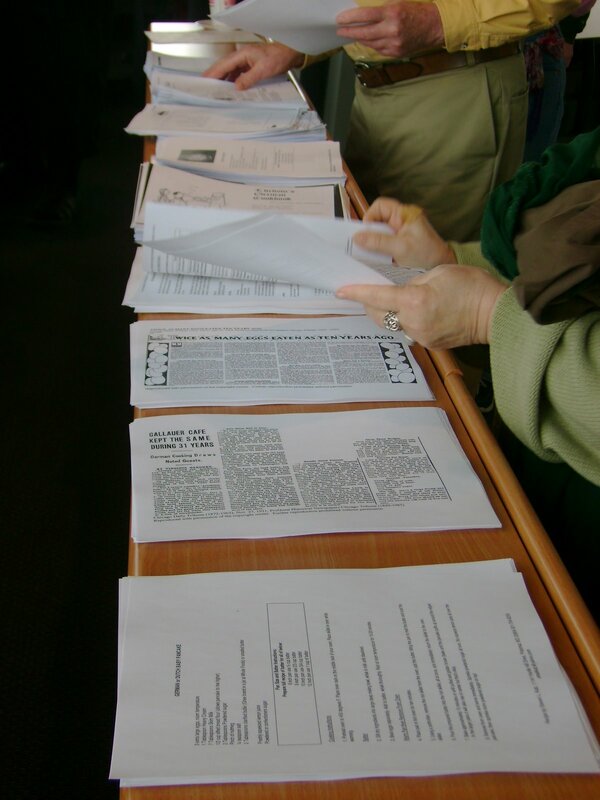 There were many recipes for Classic Baked German Apple Pancakes shared at the presentation. I encourage you to find a favorite recipe for a classic baked german apple pancake…. which would be perfect for a Sunday morning! Today was a fun filled day with our new friends in Milwaukee, WI. 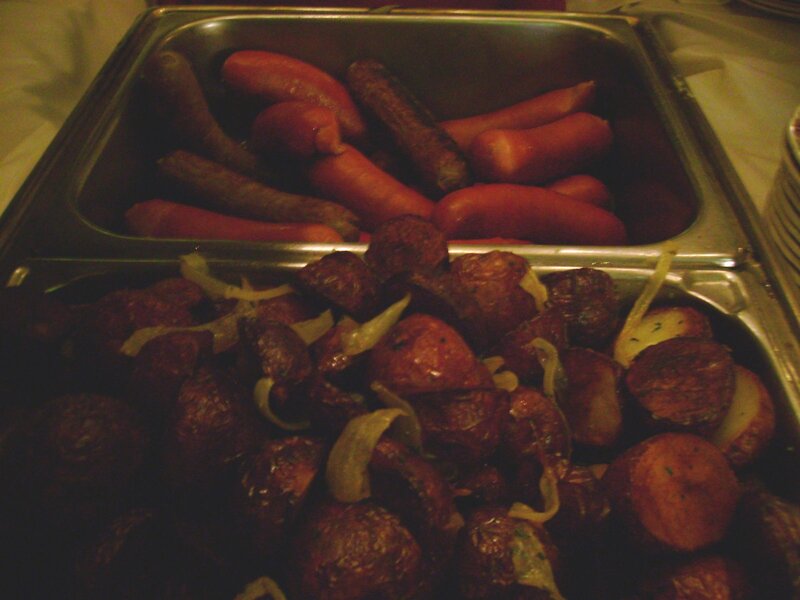 We enjoyed a delicious and plentiful German brunch at Mader’s, a Milwaukee institution of German eats. In the 1800s and continuing well into the 1900s, the most populous, and influential, single group of immigrants in Milwaukee came from Germany. 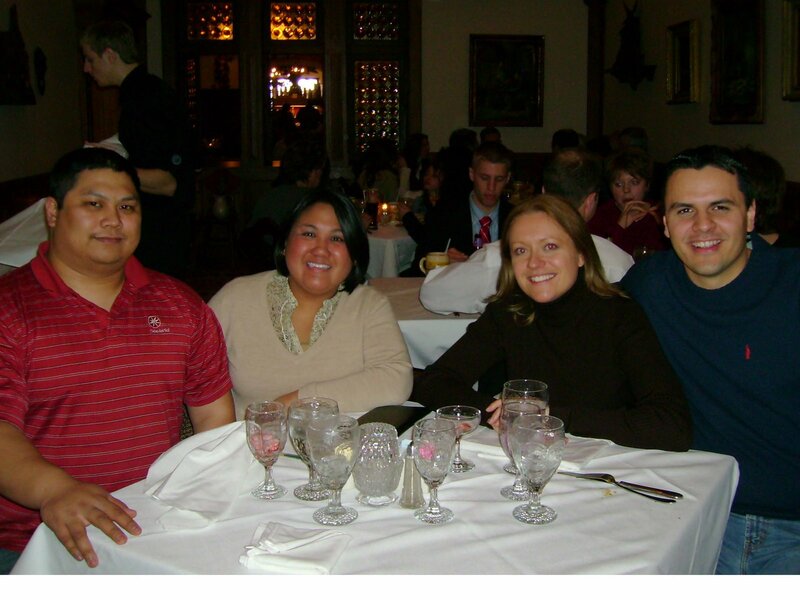 Their influence lives on in the likes of the Miller Brewing Company, bratwurst, Teutonia Avenue, Schlitz Park, the Germania Building, the German-American Immersion School, Gemutlichkeit, and especially, German cuisine and the restaurants that serve it. If you ever find your way to Milwaukee, we highly recommend an authentic German meal at Mader’s. 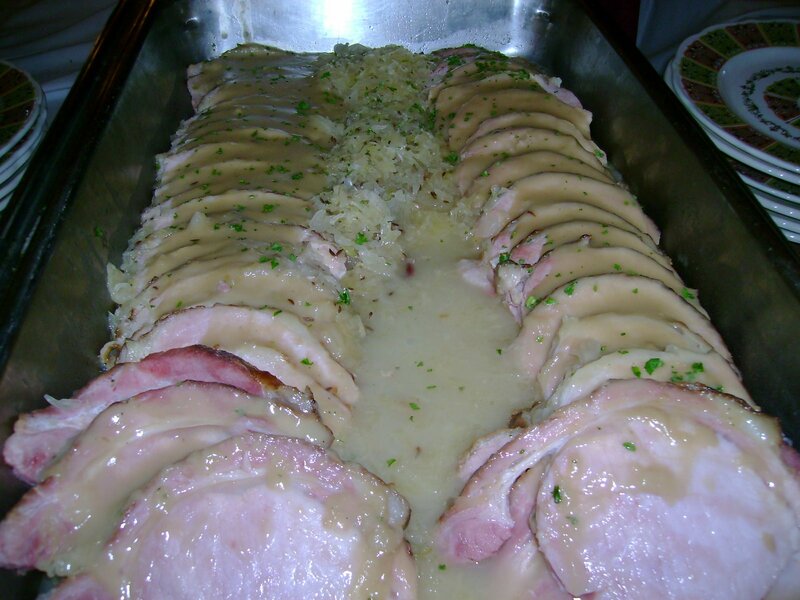 Their place is warm, inviting, full of history and it all translates in their rich German foods! After filling up at Mader’s, we hit up Alterra Coffee Roasters for an extra jolt of energy to help ease our food coma. It’s a local coffee chain and feeds Milwaukee’s caffeine needs like no other. In less than 10 years, Alterra has firmly situated itself as a truly important Milwaukee company. Sold in stores and coffee shops around Milwaukee and beyond, this local roaster also has locations of its own. Their coffee is smooth, rich and their extra shots of espresso really gives you that jump start! 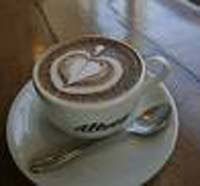 Starbucks needs to watch their back because Alterra has some serious coffee.